2014 is coming to a close, and as I read the many excellent reflective educator “end of the year” blogs, so many are asking how to move forward in 2015. What will it take to transform our schools into the centres of learning our children need? What can we do to #CTW (Change the World) in 2015? So many educators are already giving so much to their work. Fullan and Hargreaves (2012: Professional Capital, p.3) warn about the dangers of individual educators in unsupportive environments. How do we create the conditions that allow our best thinkers, our teacher leaders, to thrive? In “Great to Excellent: Launching the Next Stage of Ontario’s Education Agenda” (2013), Michael Fullan outlines the importance of “leading from the middle”. Are we building the capacity of our best education thinkers to lead from the middle? Is leading from the middle even possible in our current system? No longer is it necessary for educators to progress through a series of AQ courses or PQP qualifications to learn and think deeply about practice. Rich learning and conversations are available 24/7 on social media like twitter. Leaders with and without titles are learning and sharing with others around the world. But are their own colleagues open to their new thinking? What happens when school, board and provincial policies are challenged by educators who think differently? Is anyone listening? More importantly, is anyone providing encouragement to continue? Shared under a Creative Commons Attribution Share-Alike license by Frank Jakobi. It takes enormous courage to question those who make decisions about public education. Are we embracing those who ask the questions? Are we flattening our organizations so that all voices can be heard? For @Dunlop_Sue, my “one word” for 2015 has to be COURAGE. We all need to have the courage to put student learning at the very centre of every decision we make, even if it means challenging the status quo. Be courageous in 2015. Put student learning first. What is your “one word” for 2015? 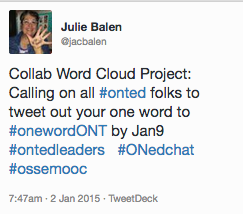 Tweet it under the hashtag #oneword or if you are from Ontario, tweet it as #onewordONT right now. Let’s see what matters in education this year both on the world and #Ontario fronts. You’re right, Donna, it takes courage to step forward and bring ideas that are different from others’, especially when uncertain of the outcome. What will your first courageous act be? I think the challenge for me is trying to balance the needs of others with the urgency of changing the way we continue to “do school”. It’s patience vs. urgency when it comes to student needs and I need to learn to find that balance. Putting student learning at the centre might sometimes mean taking a long-term view of this, and I’m not sure I always see the importance of “being on the path”. I’ll let you know how the courageous pieces work out! Keep sharing how “change” is moving forward for you this year.